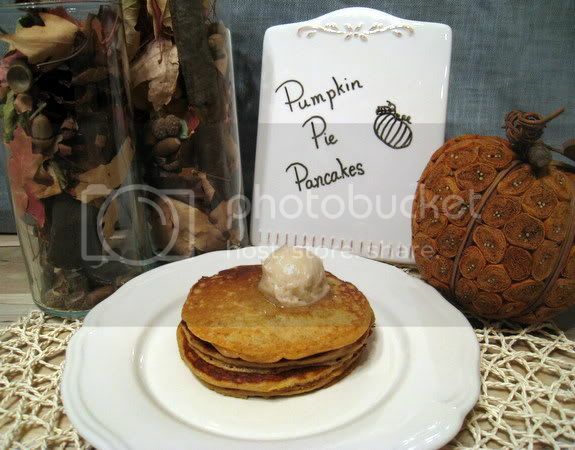 Phe.MOM.enon: Pumpkin Pie Pancakes - Happy Thanksgiving! Pumpkin Pie Pancakes - Happy Thanksgiving! Happy Thanksgiving!!! Here I give you something we are always grateful for around our house - pancakes! Not just any pancakes though - these are tender, gently spiced with just the right amount of pumpkin flavor and oh so delicious. 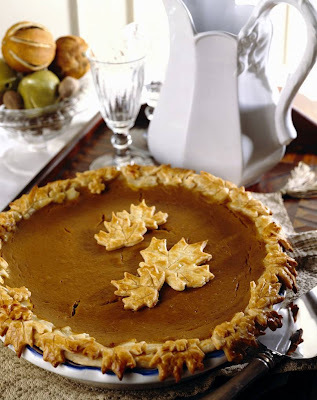 I say, why wait til dessert to eat the pumpkin pie - start with breakfast. I hope that everyone has a wonderful day filled with warm memories and great food! My apologies to my CEiMB friends - I haven't had a chance to make my mac and cheese yet but hope to get to it soon and post it before the 30th! 1. In a medium bowl, whisk together the flour, granulated sugar, brown sugar, baking powder, baking soda, spices and salt. In another bowl, whisk together the buttermilk, eggs, melted butter, rum and vanilla to blend thoroughly. Pour the liquid ingredients over the dry ingredients and mix with the whisk, stopping when everything is just combined. (Don't worry if the batter is a bit lumpy.) With a rubber spatula, gently but thoroughly fold in the pumpkin puree. 2. If necessary, lightly butter, oil or spray your griddle or skillet. Preheat over medium heat or, if you're using an electric griddle, set it to 350°F. If you want to hold the pancakes until serving time (or for up to 20 minutes), preheat your oven to 200°F. 3. Spoon 1/4 cup of batter onto the griddle for each pancake, allowing space for spreading. When the undersides of the pancakes are golden and the tops are lightly speckled with bubbles that pop and stay open, flip the pancakes over with a wide spatula and cook until the other sides are light brown. (These are soft and puffy, so turn carefully.) 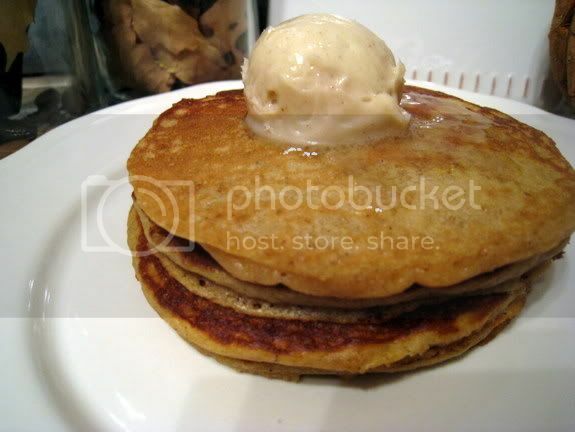 Serve immediately, or keep the finished pancakes in the preheated oven while you make the rest of the batch. Yum! Have a wonderful Thanksgiving! Ohhh... the perfect Thanksgiving breakfast! Yummy! Ooh, yum! I kind of wish I'd seen your post before I made breakfast this morning. =) Happy Thanksgiving! 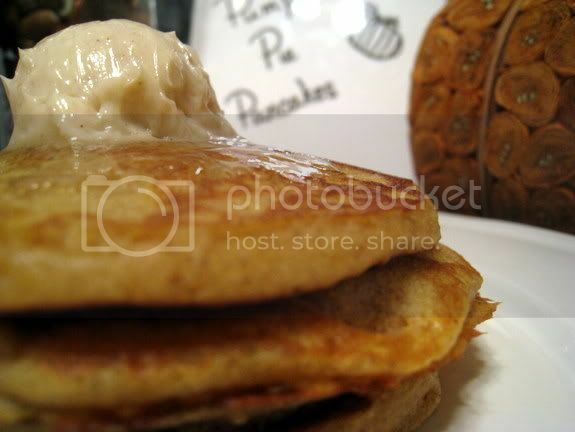 pumpkin pie pancakes sound delicious! I sure hope it's acceptable to eat these after Thanksgiving, because they look SO good to me right now! !